Sure, being a fighter pilot might actually be miserable, but there’s no denying that it can be an absolute rush. I mean, you think you’ve done a hard turn before? 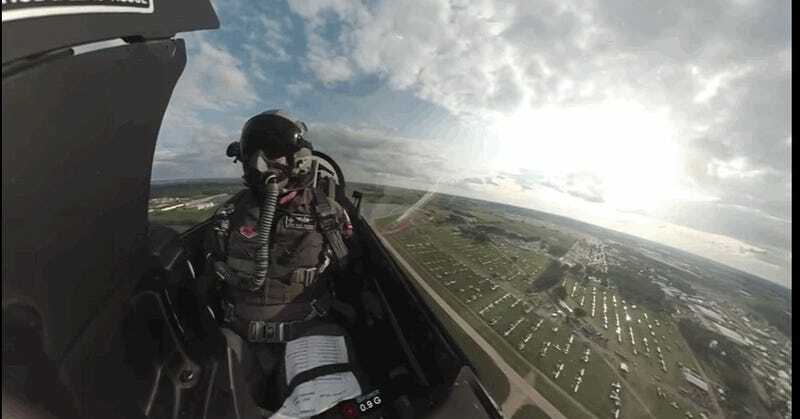 Then see what it looks like when an F-16 Viper does a hard turn in a stabilized video. It can be admittedly hard to really get a feel for what it’s remotely like to fly a fighter jet. Most videos we see tend to be from the gun camera, which is fixed pointing straight ahead. And because airplanes fly in, you know, THE SKY, there aren’t many things up there to provide a point of reference. Especially if the jet has any sort of up-attitude, and all you can see is the blue of eternity. Or worse, the gray of clouds. Oh, and in case you think just any old schlub can do a hard turn in an F-16, see if you can spot that little tiny G-meter in the GIF up top. It peaks out in that one turn at 8.3G, which means that if you weighed 175 pounds on the ground, you’d feel like you weighed a face-crushing 1,452 pounds while making a hard right. The pilot in the video, Major John “Rain” Waters according to the Aviationist, surely must do endless face exercises. Just cheek thrusts and brow lifts, all day. Truly, the face of Hercules. Gotta keep everything in the right spot somehow.